Ashley Industrial Molding currently has over ten compression presses capable of manufacturing product utilizing Sheet Molding Compound (SMC) material. 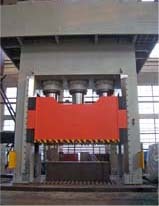 Our presses range from 400 to 4000 ton. We use a low VOC emission, closed mold process to produce thermoset components. This manufacturing process brings matched die steel molds together under a control state, and using a combination of heat and pressure from the hydraulic press, produces a structurally sound part. This process produces high quality, dimensionally consistent parts. The parts produced by this process have a smooth surface, with aerodynamic geometry, which is suitable for painting.